"Low key, keeping it real"
Probably a bit more attention to sentence detail needed when responding to customers too! CW getting involved in politics puts me right off! This. It pi**ed me off the first time I saw it in Loupe but said nothing about it. Now they have made it part of their on-the-street advertising. I really, REALLY dislike companies signalling politics. The USA has become ridiculous with it. Bad move CW- I hope you are happy with the demographic you are appealing to buying one watch and calling it done. Location: Berlin - Brexit Refugee! All I will say if that I’m not sure if the Great British public can be relied on to do any research!!!! Watches - Too many but not enough! Isn’t that the main customer demographic? Men of a certain age? I know they’re trying to get a younger base, so perhaps that’s why they’re trying to be a bit more edgy. 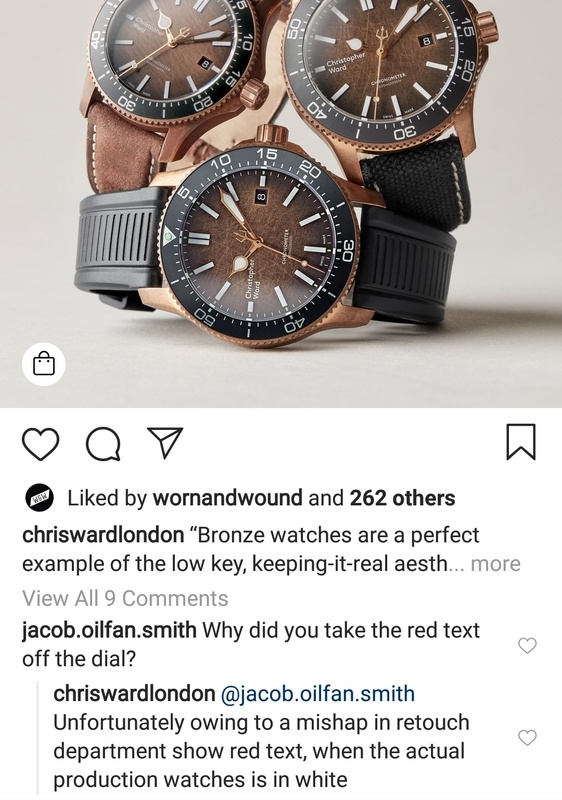 Does make the whole spiel about the importance of branding sound a bit hollow by going for the younger sounding chriswardlondon rather than the more staid sounding Christopher Ward. There have been a couple of occasions where they’ve seemed to have loosened their adherence to the official branding, and this is one of them. Agreed. It upsets more people than it appeals to. Trendy, edgy? Nah, stick to good business and first class products. I'm new here looking for more info on the new Worldtimer , although I have previously owned a couple of CW pieces . From the US , proud Republican , BUT I prefer my watches to remain politically neutral, they are marketing/selling a brand worldwide, with the US as a large consumer of timepieces , why potentially alienate 1/2 of your market ?? Especially when promoted by a entity outside of the USA , we can squabble amongst ourselves but our hackles get raised when puns/insults/digs come from abroad. Would the British market appreciate an American watch company slighting or poking fun at the Queen as part of their ad campaign ?? I think not ..
And finally "Are We British Enough For You?" on timepieces clearly marked Swiss Made ??? What does that even mean ?? No problem Neal, stay with us and we'll soon get you speaking and spelling English correctly. That video is ridiculous. Totally wrong way to advertise imo. Also, i use different tubes every single day and havent seen a single one yet. Whilst remaining largely ambivalent towards the posters I do like the video. Disruptive (sic)? Certainly, but it seeks to disrupt and question some common preconceptions about the watch industry. Since Helen has asked for my feedback I can only say that the current advertising campaign did not hit the spot for me. That said I'm not the Target audience. I'm confident however that we will hear at a later date that it was a blinding success. The results of my field test, following what is fortunately now only a rare trip to London yesterday. Didn’t see any posters, as the Waterloo and City line was closed all day due to industrial action. Had to get the Jubilee line to London Bridge, then Northern line to Bank. Five deep on the platforms, with thousands of angry, tired commuters meant no visibility of any cross-track posters. Quieter for the return journey - but still no site of any posters. Back on to the station concourse at Waterloo. Platform for home train not on board, giving about 10 minutes to “search” for the Video, that I knew was there somewhere! Found it and managed to just about take a pic, before it disappeared. As someone who knows the brand, I think it becomes more difficult to judge the video content, however I didn’t think it was at all impactful and it certainly would not have set me off to do my own research, assuming I noticed it in the first place. I commuted to London for about 15 years and can’t really recall paying any attention to either cross-track posters or videos above the concourse. I don’t think that regular commuters do, as they are focused on getting to work in the morning, and getting on the first available train home in the evening. The only posters that I used to notice were those situated alongside the escalators. thanks for the research Neil. i think along the same lines as you and think that advertising does very little to impact my buying decisions. the one i never get is Yokohama tyres on the chelsea shirts, i asked my brother in law about it as he is a bit more corporate savy than me and he said its just about brand awareness, whatever that means! all i know is i wouldnt go in to a tyre shop and specifically ask for Yokohama though. Advertising, brand awareness, media campaigns are all amount to the same thing, getting out to a bigger audience, nothing more, nothing less, the most important thing is targeting, and nobody on the forum needs targeting as we are all highly involved and engaged with the brand already. The most important thing to note about the picture is the Breitling advert, new modern looking logo (sans wings) and a hashtag, both of which aim to a younger audience, especially when you see the wording of the hashtag! "squad on a mission" is not something a traditional Breitling customer or collector would say, let alone use a hashtag of on social media! I think when you get to premier football, the advertising is World wide. Every premier game is shown live here in Thailand (and all over Asia and Australia as far as I am aware) and Liverpool, ManU and Chelsea, along with Barcelona, are the big teams (and Leicester when they won the league), and Yokohama are a major brand here. I'm not sure how much their decision to sponsor Chelsea was to do with the UK?